This paper, originally prepared for "Canada's children: The priority for the 90s: A national symposium" held by the Child Welfare League of America/Canada, Ottawa, October 27-30, 1991, describes Canada's child care arrangements and makes proposals for future developments. Today, Canada does not have a system of child care. 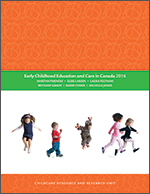 Although Canada is a developed, affluent nation, unlike most other developed nations it has not taken a proactive or even a facilitative approach to developing a system of high quality child care services. Rather, child care has developed in a haphazard manner driven by market forces, with regional inhibition and facilitation and community initiatives directing development of services. The current child care situation does not meet the needs of Canadian children, families or women.